Hooray! We are getting our very first look at some of the merchandise that will be available at the 2014 Epcot Food and Wine Festival! There are some great pieces to whet our appetites — for souvenir shopping! 😉 The Festival kicks off September 19 — mark your calendar and plan a visit to Epcot — because you won’t be able to purchase items via the Disney Parks Online Store this year. Right out of the shoot, we are seeing two different logos on several items. The first theme is Taste Your Way Around the World. The bold, retro look of the font is fun and evokes the adventure of international travel — perfect! And don’t you love the skyline at the bottom, which highlights the icons of the World Showcase Pavilions? 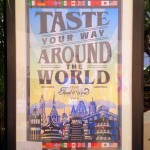 2014 Epcot Food and Wine Festival “Taste Your Way Around the World” Logo! The other motif we see repeated is an homage to beer! Brews Around the World promises to be a popular choice among guests who enjoy trying all the brewskies available at the Marketplace Booths. Equally handsome, the rustic logo channels a painted wooden plaque look. It also features the landmarks of World Showcase. 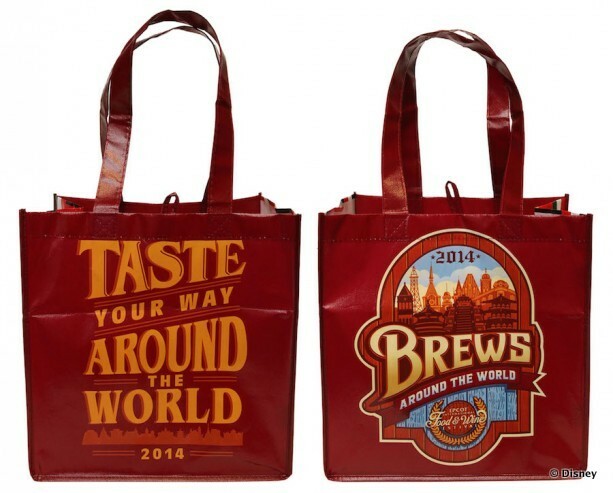 Score the reusable tote in 2014, and enjoy both logos — one on each side! 2014 Epcot Food and Wine Festival Reusable Tote — Two Awesome Logos in One Great Bag! 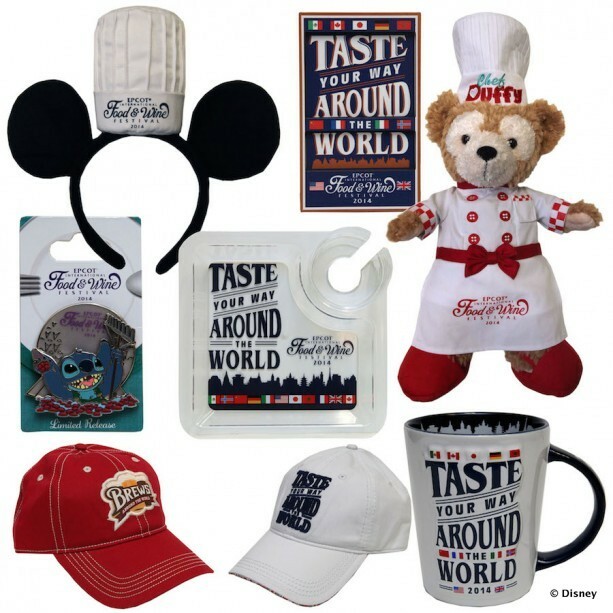 Duffy once again dons chef wear, and aspiring chefs — or fans of eating — can get their Mickey Ears with a chef’s toque! We also love the collector’s pin featuring Stitch in the Cranberry Bog! We will be sure to give you a full tour of all the merchandise available at Festival Center and throughout Epcot when the Epcot Food and Wine Festival gets underway! 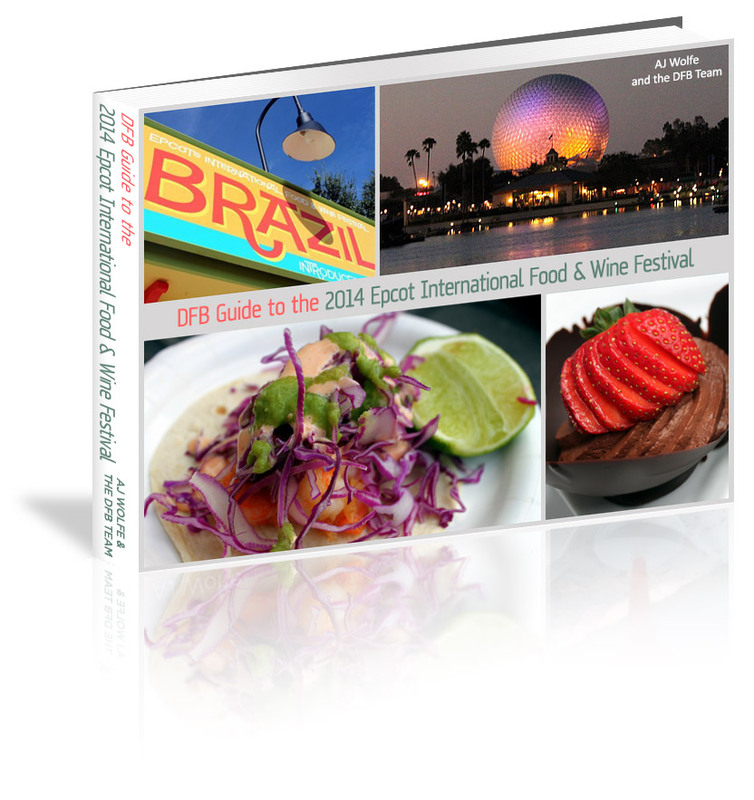 We continue to compile all of the latest news and updates on the 2014 Epcot Food and Wine Festival right here, so stay tuned for details and check out all of the info below! Which items will you be taking home from this year’s Festival? Leave a comment with your favorites! Rach — I can TOTALLY do that! 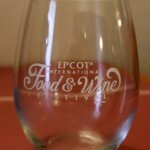 I am SOOOOOO excited to see a F&W Mug with the year on it again. I think the last one we found was from 2006. I always get a new mug on our trips. I am in LOVE with that one & this will be my first F&W! I wonder why they will not have items for sale online this year? Fortunately I will be down there to get some of these items! I like the tray I got last year as it’s more colorful but still these items look fun! While the tray barely holds two items the drink part of the tray is helpful if you are touring solo. 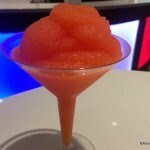 I managed two items and a drink and it helped me a lot last year. Plus it fit in my gym sack bag as I hate to carry anything with me so I try to take as little as possible when tour the parks. It will also help that I can pay with my magic band this year! Can’t wait to see all of the merchandise offerings! 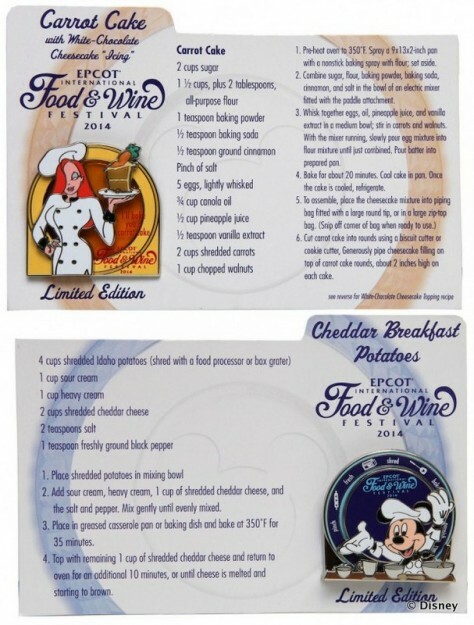 This will be my first time at food and wine and I’m so excited for this merch! Do you have any idea how long the limited edition pins will be around and where to get them? And I hope they have another food themed vinylmation this year! Becky — The pins will be available at the Festival Center until they sell out. They will indeed have another vinyl for the festival this year. I, sadly, won’t be able to make it down there this year. Do you have any idea if I could get even just the cookbook by calling the park merchandising line? I went to the Flower and Garden festival this year and am really hoping to get the cookbook as it includes both festivals. Heather, if you find out could you let me know too? This will be the first time in 15 years I can’t go (still recovering from a bone marrow transplant for AML, not allowed to eat in the food booths just yet) and I would love to get their new cookbook since it has recipes from several of their festivals that occur during the year. I cannot wait for this event! Going to this twice!